Food combining is the art of giving your stomach the right foods at one meal so that it has the ideal combination of digestive juices needed to break down whatever is in the stomach. Sugars, proteins and fats all need different digestive juices in order to be properly digested. If they are all mixed together, then each digestive concoction becomes diluted and unable to fully break down its specific food. This leads to improper assimilation, bloating and more. Food layering is the art of giving your stomach the right foods in the right order so that it has the ideal combination of digestive juices needed to break down whatever is in the stomach. “….. 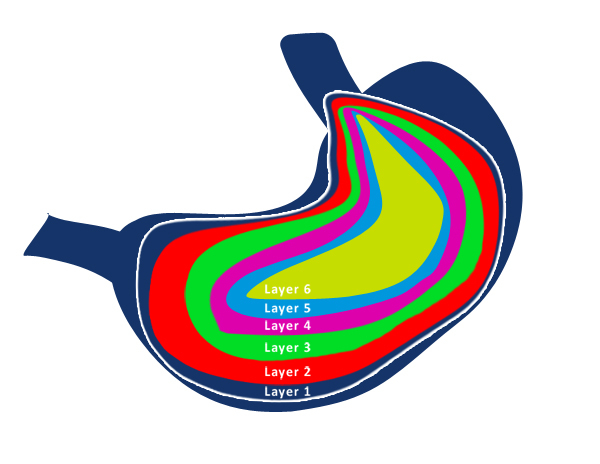 If there are 5 different types of food in the stomach at one meal, each eaten separately and in sequence, there will be 5 different kinds of digestion going on at the same time, each layer having different enzymes digesting each food, according to the needs of the food contained in that layer. Image of ideal food layering; each food has its own digestive sack or layer and is able to fully break down its specific food without interference from antagonistic digestive juices. Layer 1 in this case was eaten first, followed by 2-6 sequentially. So what’s the difference between food combining and layering? With layering, one can basically eat whatever foods they want at a meal, as long as they are eaten in the proper order, i.e. the most watery foods first and proteins last. This tends to work very well, although not as well as when coupled with proper food combining guidelines. Why Combine and Layer Food Properly? Because most food cannot be assimilated in its natural state and needs to be converted into easily absorbable micro particles; our delivery mechanisms (how we eat, cook and store foods) are the secret to optimum health through nutrition. Correctly combining and layering foods is essential for optimum digestion and assimilation. Improper food combining, layering and poor nutrient absorption contribute to and can even be the main reasons people have bloating, indigestion, diarrhea, gas, upset stomach, arthritis, asthma, allergies, chronic fatigue, aches and pains, poor memory, disorganized thoughts and more. Without proper digestion, nutrients in even the most wholesome of foods cannot be fully extracted and used by the body. The goal is not to be a perfect food combiner, at least not at first. There are many things to learn and practice with this topic, so looking at it as a self-experiment in eating and health will make sure a person gets the most out of it. With a little practice and awareness one will save their gut a lot of discomfort, get the most out of their food, lose weight if needed, and most importantly stop flooding the blood with waste bi-products from all the food that is spoiling in their stomach from being combined or layered wrong. simple try it and judge for yourself. Follow the food combining and layering rules whenever possible (see next pages and links). Layering is most important and should be done even when following proper food combining rules. When ideal food combining can’t be had, focus on layering the foods properly. Eat the most watery food first, followed by the second most watery, and so on. 1. Do NOT eat protein foods and carbohydrate foods at the same meals. Protein foods require an acid medium for digestion while carbs/starches require the opposite. Food layering modification; eat the starches first, then the protein. 2. Eat fruits alone on an empty stomach and wait 20–30 min before eating again.Food layering modification; eat the fruit first, then the heavier foods. 4. No cold water or more than 4 ounces of liquids with meals. Try to use 4 ounces of warm tea or water, kombucha or apple cider vinegar as liquids to aid digestion, otherwise no more liquid fifteen minutes before or until 60 minutes after a meal. 5. Eat high fat foods and proteins at separate meals, or keep the fats to a very small amount. Some foods, especially nuts, are over 50% fat and require hours for digestion, which slows all other digestion. Like I always recommend, don’t believe science until you try it for yourself and notice the difference.